There is much to take away from the Brave’s comeback victory in the rubber match of the series, not the least of which is the overpowering strength of the Atlanta bullpen, but for my money it’s the nature of Manager Mattingly – the guy seems both timid and conventional, styles that can work well when you walk into a knife fight with a gun, but tend to work less well when you have the talent level of the 2012 Los Angeles Dodgers. In a previous post I detailed my displeasure with the Atlanta Braves manager’s decision to sacrifice bunt with runners on first and third and one out in the inning. Well, in this game, Mattingly was presented with an almost identical situation, but with the pitcher coming to bat with nobody out instead of one down. Manager Mattingly chose to have his pitcher bunt, which is not as terrible a decision as his counterpart across the diamond made, but is simply not aggressive. So many managers and coaches, in every sport, make the decision that will not get them fired rather than the one which will best benefit the team. Nobody questions a pitcher laying down a sac bunt, because pitchers are traditionally lousy hitters and that’s what pitchers have done for decades. And in certain situations, it’s clearly the right decision for the pitcher to drop one down and advance the runner. But it is a move designed to raise your team’s likelihood of scoring a single run, while necessarily decreasing the probability of scoring multiple runs. So in late-game scenarios, a single run takes on elevated importance, but early in the game, it seems better that a team should be attempting to score as many runs as possible. Giving an out away to advance a runner from first to second is questionable in all early game situations, regardless of whether the pitcher is at the plate, because outs are too valuable to simply give away and also because sacrificing limits your chances at big innings. Aggressive baseball isn’t just stealing bases or sending runners around third for close plays at the plate – it’s attempting to score a lot of runs when doing so might lower your percentage of scoring a single run. Faced with no outs, Mattingly’s decision to bunt with runners on first and third was substantially better than Atlanta skipper Gonzalez’s choice to do so in the same situation but with one out, but this is almost by default and it was undeniably timid, a decision rooted in a trying-not-to-lose mentality. As if this wasn’t irritating enough, later in the game, Mattingly removed starting pitcher Lilly after seven innings of three-hit ball, after having only thrown 79 pitches. This decision is questionable if you have Atlanta’s ace relievers, but the Dodgers bullpen is nowhere near that level, and so unless Lilly was complaining of fatigue or pain, this was a very poor decision by the manager, and one rooted in the assumptions of the contemporary game. The modern game leans towards fewer complete games and more influence from specialty relievers to get outs in late game situations. This isn’t necessarily bad, but as it has become more and more the standard for major league baseball, there is a tendency to play games structurally rather than situationally. Leaving your starter in or taking him out shouldn’t be based on whether it’s the start of the eighth inning, but rather his level of effectiveness and fatigue. If neither are a factor, then there is no need to make a change. It’s the same impulse that causes managers to bring their closers in only in save situations, when it’s blatantly obvious to anyone who gives it more than eleven seconds of thought that the time to use your best pitcher isn’t automatically going to be in your opponent’s final at bat with a lead, but rather one in which you most desperately need to record an out(s). Runners on second and third with one out and a one-run lead in the seventh is a much more dire situation than a two-run lead to start the ninth, yet virtually every manager in baseball is loathe to utilize his closer, his best relief pitcher, in anything but a save situation. Mattingly’s decision to yank his starter after seven innings is a function of modern baseball, so maybe I shouldn’t blame him so much, but it does not inspire me with any confidence in his abilities. The game wasn’t a complete wash, though, as my mom came to the park with me to enjoy the game and we got to hear the Dodgers public address announcer tell us that due to the ‘unique’ conditions we were experiencing, we would be able to show our tickets at the box office and receive two free tickets to a future game. Later on it rained, which I wouldn’t qualify as unique, but at the time of the announcement there had been no inclement weather of any sort. I’m starting to think the Dodgers are of the opinion its fans are giant wusses. 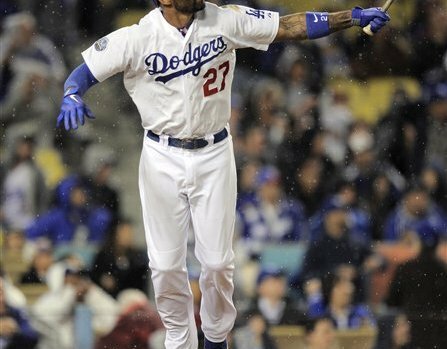 We also got to see Matt Kemp hit a tape-measure home run in the rain. Again, I make the argument this guy should not be sent down to the minors. This entry was posted in Atlanta Braves, Baseball, Los Angeles Dodgers and tagged Baseball, Los Angeles Dodgers. Bookmark the permalink.